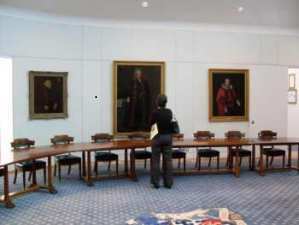 On Saturday 20 September 2008 Haberdashers’ Hall was opened its doors to the public as part of the annual Open House London event, whereby a number of houses around London were open for the public to visit free of charge. I had visited the old Haberdashers’ Hall in Staining Lane on a number of occasions, and ever since the new Hall opened in 2002 I have been promising myself that I would visit it one day. Up to 2008 I had never managed to make it. However, Open House London presented me with a great chance to correct this omission, and I am pleased to say that I took advantage of this opportunity, along with Jan and Helen. We had a smashing day, and were hugely impressed by the building and the hospitality with which we were received. I think the Hall is a superb building. 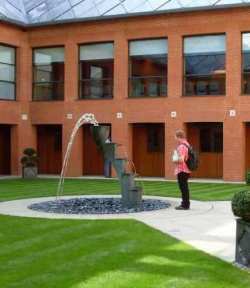 The facade blends well with the surrounding buildings in West Smithfield, but when you cross the portals and make your way into the building you come face to face with a lovely grassed courtyard with a very attractive fountain at its centre (see photograph below left). We entered the Orangery and were greatly impressed by a painting of a Panorama of the Modern City of London by Jeffrey Morgan. This was a very attractive work, but what struck us most were the figures painted into the foreground of the picture. These were four eminent members – Princess Margaret, Sir Robin Brook, Robert Aske of the Haberdashers’ Company – Princess Margaret, Sir Robin Brook, Robert Aske and “our” John Bankes (c1652-1719) ! The artist had copied Bankes as he appears in his portrait, which has hung at successive Haberdashers’ Halls since his death in 1719. We went up the stairs, to visit the suite of rooms on the first floor. These are very fine indeed, and they contain many treasures. We saw many fine paintings (including works by Reynolds, Gainsborough, Kneller and Romney) much beautiful furniture, and many interesting and impressive artefacts. However, the item that we really wanted to see was the portrait of John Bankes, which still hangs in the Company’s Court Room, as laid down in Bankes’s will. 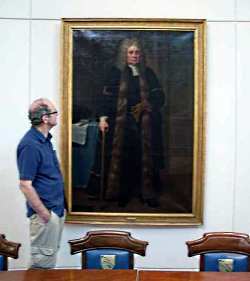 We spent quite some time gazing at the Bankes portrait, and taking photographs. To me this is the most wonderful thing. To be able to see an image of our benefactor, nearly 300 years after he died! Our visit to Haberdashers’ Hall was completed by a short meeting with David Bartle, the company Archivist. He very kindly spared us a few minutes for a chat, and a look at the Bankes Pedigree Books. Yes – you read that correctly. There are two pedigree books. One of them is exactly as it was when it was created at the start of the 20th century. The other copy is updated with any additional information about the Bankes pedigree that the company receives. We left Haberdashers’ Hall having enjoyed our visit greatly, and with a very favourable impression of the building which, I think, effectively combines the modern with the traditional. The building is well lit throughout, and has a very spacious feel, compared to the previous hall in Staining Lane. The Company’s collection of pictures and artefacts now have a home in which they can be displayed to best advantage. 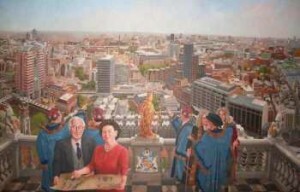 Panorama of the Modern City of London by Jeffrey Morgan, with Bankes in foreground, partly hidden.